The bloody aftermath of the attack inside the main prayer hall of St. George’s church in Tanta. Two Coptic Christian churches were bombed on Palm Sunday in Egypt, killing at least 40 people and injuring more than 100, according to Egyptian authorities. ISIS has claimed responsibility for the morning blasts, which targeted St. Mark’s Church in the city of Alexandria and St. George’s church in Tanta. Pope Tawadros II, the leader of Egypt’s Copts, had visited the church in Alexandria on Sunday, but was not harmed. 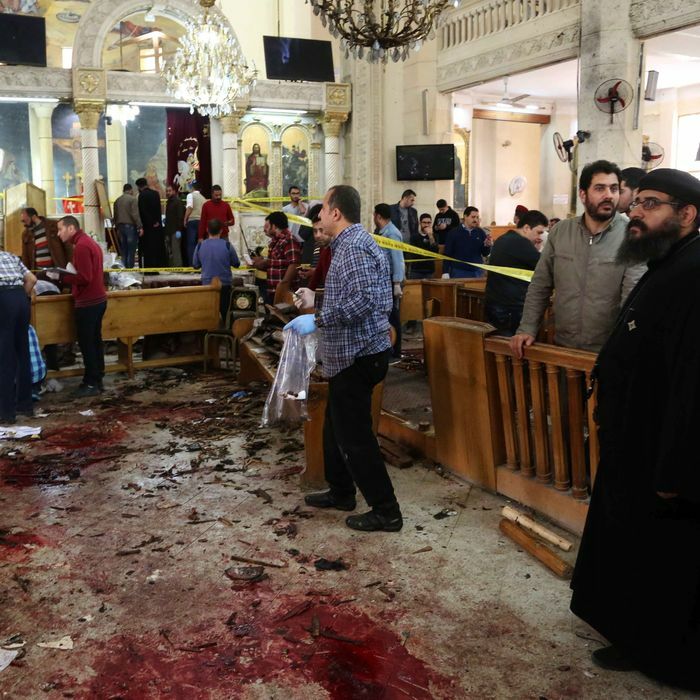 The first blast, in Tanta, struck inside the main prayer hall, and priests and members of the church choir were reportedly among the at least 27 killed in that attack. Hours later in Alexandria, a suicide bomber struck outside St. Mark’s as parishioners were leaving the Palm Sunday service. Police apparently prevented the bomber from entering the church, and four officers were among the at least 13 people killed there. Pope Francis, who is scheduled to visit Egypt later in the month, has condemned the bombings, which are but the latest attacks to target Egypt’s Christian minority. Orthodox Copts make up the majority of Egypt’s Christians, who comprise about 10 percent of the majority-Muslim country’s total population. In December, another ISIS-claimed suicide attack killed at least 25 people in a strike on the main Coptic church in Cairo. Violence against the minority has been on the rise since 2013, when Egypt’s military overthrew the popularly elected Islamist president and facilitated a crackdown on Islamists throughout the country.